Dorm room storage space can be hard to come by so if you have a raised or lofted Twin XL bed you are in luck! All that extra space between your college mattress and dorm room floor is perfect Twin XL underbed storage. But even if you are using helpful college underbed storage items it can start to look a little messy underneath your extra long Twin bed with so many dorm room supplies under there. Our extended dorm bed skirt panles will help you cover up any unsightly dorm underbed storage. Dress up your dorm bed with this Extended Dorm Sized Bed Skirt Panel with Ties - Orchid Petal. Dress up your dorm bed with this Extended Dorm Sized Bed Skirt Panel with Ties - Nightfall Navy. Dress up your dorm bed with this Extended Dorm Sized Bed Skirt Panel with Ties - Smoke Blue. Dress up your dorm bed with this Extended Dorm Sized Bed Skirt Panel with Ties - Purple Reign. Dress up your dorm bed with this Crinkle Extended Dorm Sized Bed Skirt Panel with Ties - Silver Birch. Dress up your dorm bed with this Crinkle Extended Dorm Sized Bed Skirt Panel with Ties - Alloy. Dress up your dorm bed with this Crinkle Extended Dorm Sized Bed Skirt Panel with Ties - Jet Stream. Dress up your dorm bed with this Crinkle Extended Dorm Sized Bed Skirt Panel with Ties - Rose Quartz. Dress up your dorm bed with this Crinkle Extended Dorm Sized Bed Skirt Panel with Ties - Glacier Gray. Dress up your dorm bed with this Crinkle Extended Dorm Sized Bed Skirt Panel with Ties - Hint of Mint. 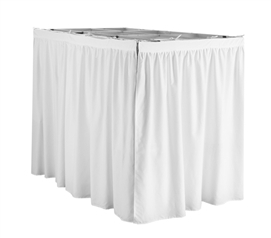 Dress up your dorm bed with this Crinkle Extended Dorm Sized Bed Skirt Panel with Ties - White. Dress up your dorm bed with this Crinkle Extended Dorm Sized Bed Skirt Panel with Ties - Black. 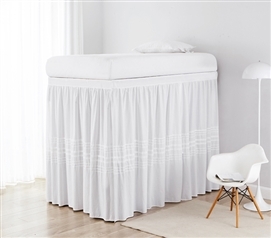 Dress up your dorm bed with this Extended Dorm Sized Cotton Bed Skirt Panel with Ties. Dress up your dorm bed with this Luxury Plush Extended Dorm Sized Bed Skirt Panel with Ties - White. 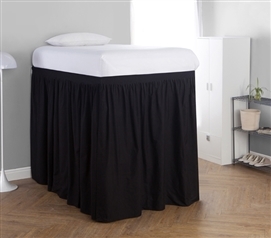 Dress up your dorm bed with this Luxury Plush Extended Dorm Sized Bed Skirt Panel with Ties - Black. Dress up your dorm bed with this DIY Threads Bed Skirt Panel with Ties. At DormCo, our extended college bedskirts are perfect for hiding your Twin XL underbed storage but that isn't the only thing that makes them special! With so many beautiful colors and styles of dorm bed skirt panels you'll be able to find the perfect match for your Twin extra long bedding. And when you have a stylish looking Twin XL size bed you have an amazing looking college dorm room.